Inspired by recent achievement of Jesper’s – Antarctic ICE Marathon and member of the 7 Continent Marathon Club, Daniel decided to run his life 2nd marathon in Africa. The plan wa, among many, to run the Marathon outside of Europe and get som sun in the middle of freezing Polish winter. 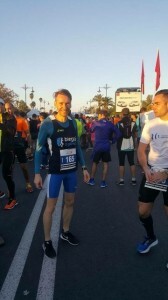 Marrakech Marathon appeared to be perfectly suited to fulfil both. Daniel arrived to Morocco Friday January 27th and what a surprise it was to him to see rainy and grey sky. Fortunately, enough the weather was better and better and after 1 hour walk from airport to the hotel we got what we wanted – sun all over the place. The trip to Marrakech was not just to participate in the marathon, but enjoy the city and beautiful surrounding.. Marrakech and Morocco has a lot to offer for tourists, but in order to fully enjoy it, staying there for 3 days was not enough. The city is clean and very green one with a lot of nice and decorative paths along main roads. People are rather friendly and helpful. On Friday and Saturday, we waled the city all around from early in the morning till the evening. 20+ km daily on foot a day before start, is nothing that an experience marathoner would recommend. This there there was no room for cargo loading and rest. Moreover 2 sleepless nights because of the flight and first symptoms of illness, were nothing that Daniel would wish to anyone. First 30 km were according to the plan: good timing, pace under control. Problems started however a bit later. Most of the time is where you „Hit the Wall”, though the initial symptoms of lack of power where due to shivers as the medicine stopped working. Last 10 k was the longest one Daniel ever run. At this stage there was a new goal after each kilometre of the run, first to make it to finish line and bread 3 hours and 25 minutes, few minutes later it was obvious that breaking 3:30 might be challenging. Last 4 km it was just to strangle to finish the race. Daniel crossed finish line with a time of 3 hours 33 minutes and 9 seconds which is still his personal best. There was though no satisfaction and enjoyment after the race. New experience has been gained and lesson learned that will benefit in upcoming marathons and half marathons. All in all apart from organisational struggles, there were many bright points about the marathon. The weather, a lot of supporters or bottles water were some of the tiny things that made the marathon enjoyable after all. Not to mention nicely selected paths, great and colourful surrounding and nature. The editor – Jesper – hereby thank Daniel for sharing his experience with the followers of Bornholm Runners members. At the same time we are looking forward to Daniel breaking his next target 3 hours 30 minutes.